A genuinely Smart Home therefore needs a sensory system: a network of sensors to convey accurate, relevant and real-time information about what you're doing. Alarm.com's Smart Home solutions are built with this sensory system as the foundation. It's the Smart Home Security system: the one system that can provide a continuous, real-time stream of information on what's happening all around the home. The security system's door, window and motion sensors are installed around the home to detect intrusions when the system is armed and activity when the system is disarmed. They can also trigger other devices to respond to activity in real-time. For example, when you come home from a long day, your hands full of groceries, the lights inside your home can automatically turn on when the front door opens. These sensors also make our smart thermostats a lot smarter, helping you reduce energy waste automatically. The first (and still the best) rule to save on heating and cooling is to keep doors and windows shut. Thanks to the security systems door and window sensors, the thermostat can automatically turn off if a door or window has been open too long. You'll also get an instant alert so you can close that door. The connection to the security system also helps connected devices keep you safe. For example, it enables safety functionality in smart thermostats. In the event of a fire or carbon monoxide detection, an Alarm.com system turns the thermostat off so it doesn't blow smoke or gas into other parts of the house. The security system also has the best information about when a home's occupied or empty. The arming status of the security system is a key ingredient for energy savings. Most smart thermostats try to determine if anyone's home based only on activity—when someone walks by the device, or makes manual adjustments to the temperature. With Alarm.com, your thermostat simply knows when you're home or not – no guesswork necessary. When combined with location-based automation, it's a solution for effortless energy management. As well as physical sensors and arming status, the Smart Home Security powered by Alarm.com also brings a powerful cloud platform to the home. The Alarm.com platform connects the home's devices, processes the sensory data they provide, and supplies the intelligence they need to operate. We see the advantages of the security platform as a rush of other platforms (and physical ‘hubs') arrive on the market. Some have connectivity and reliability issues that cause devices not to communicate, react too slowly, or not work at all. Would-be Smart Home owners frequently end up frustrated and out of pocket (link features foul language, much of it justified). The Smart Home Security platform, on the other hand, is already proven and engineered to ‘life safety' standards of reliability: the standards you'd expect for a security system, not a connected toothbrush. It ensures that your devices communicate and delivers the computing power to automate them intelligently. A single app lets you control every connected device, while a corresponding app for security dealers enables efficient remote technical support. Installation and setup are some of the biggest challenges of creating a Smart Home. A service provider ensures that it is set up and running correctly, and that you have someone to call if there's an issue with connectivity. Smart Home Security systems also come with professional monitoring. This means that if there's an emergency at your home, a professional will respond. This is a service that standalone devices can't provide and it greatly enhances the value of connected safety devices. While a standalone connected smoke detector will send you a text if there's a fire – which isn't useful if you're on plane, or swimming, or taking a nap – a Smart Home Security system will alert trained professionals who can respond immediately. 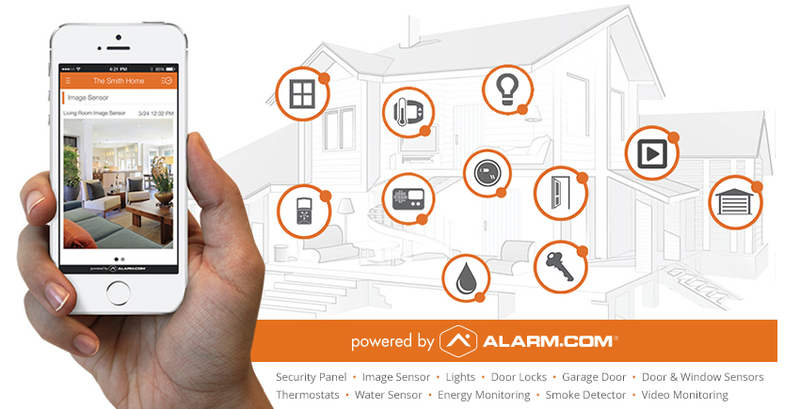 With over a decade of experience and 2 million homes using our Smart Home platform, Alarm.com provides a proven service you can trust for security and the rest of your Smart Home services. If you'd like your home to be next, click here to connect with a local Alarm.com dealer. For more examples of how security powers the smart home, check out these videos.